Will mainstream audiences respond to the book's open-minded approach to the story, and to its themes of belief and faith? I hope so. Will UFO buffs respond to its honest, no-nonsense presentation of Dr. Hynek's UFO work? I hope that, too. Will UFO experts find fault with my research and my findings? Undoubtedly. Will I care about the last point? Not so much. Why do I say this? Well, when I started to research Dr. Hynek's life and work almost five years ago, I discovered that UFO experts can be a prickly, contentious lot, perpetually prone to fussin', fightin' and feudin'. Let's go through some examples, shall we? When I started posting here about my research on the book I started getting messages from readers warning me that "If you don't interview (insert name here), your book is going to be crap," or, "If you DO interview (insert name here), your book is going to be crap." (I quickly learned to ignore both kinds of warnings and just interview whoever the hell I wanted). There were the experts who contacted me and insisted that if I didn't interview them my book would be crap. I fell for this line exactly once, and suffered through an hour-long interview with a guy who had absolutely nothing of value to tell me about Dr. Hynek. Never again. When I started out, I naively assumed that since I was writing the book with the blessing of the J. Allen Hynek Center for UFO Studies, every UFO expert would want to talk to me. Wrong. Turned out that the mere mention of CUFOS got a lot of doors figuratively slammed in my face. That was educational. Then there were the UFO "experts" who deliberately fed me false information or interfered with interviews, apparently in the hopes that they could sabotage the credibility of my book. Really, guys, you have nothing better to do? There were several UFO experts who refused to talk to me at all, regardless of my ties to CUFOS, apparently because they simply wanted to leave their UFO work in the past. This was disappointing, but for the most part understandable. Only one of these people actually hung up on me, but that one time came as a surprise! Of course, I have brought some hostility upon myself, and knowingly at that. Over the years I have had great fun here in my blog mocking the Atacama Humanoid, the Citizen's Hearing on Disclosure, the Roswell Slides, and other "big UFO events" designed to "prove" one thing or another but all of which proved in the end to be humiliating stains on the already stained reputation of UFOlogy. This has, apparently, rankled some people. 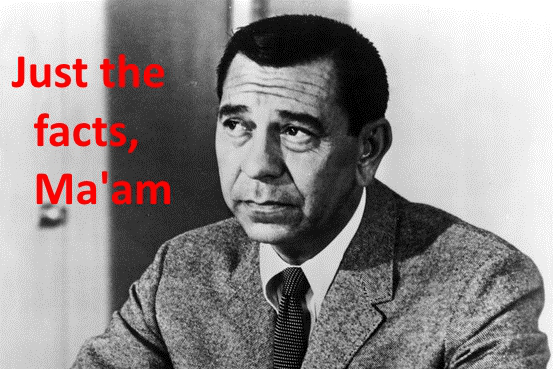 If only Sergeant Joe Friday was in charge of all UFO investigations! Also, I made the very deliberate decision to ignore conventional wisdom and take a fresh look at famous UFO cases, rather than just re-report what every other UFO researcher and writer has said before me. 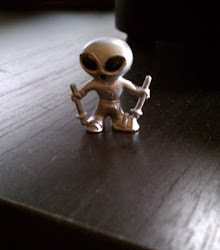 This has led to some interesting discoveries, many of which will surprise and possibly infuriate UFO experts. 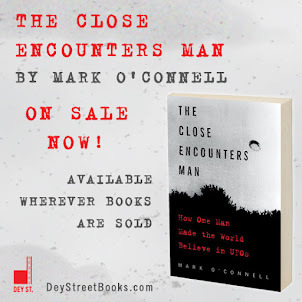 In fact, when my editor at Dey Street Books recently asked me to compile a list of statements and stories in The Close Encounters Man that would be controversial to readers, it came out to be a pretty long list. I had a sneak preview of what I have in store in March, 2016, when I gave a talk commemorating the 50th anniversary of the Dexter-Hillsdale, Michigan "Swamp Gas" case at an event put on by Michigan MUFON. When it was my turn to present, I started out by pointing out aspects of the case that have been misreported for 50 years, and I set the record straight with correct dates and timelines. Then I went through the sequence of events surrounding that case and came to the conclusion that Dr. Hynek said exactly the right thing when he told reporters that what the witnesses described seeing fit the description of swamp gas. People in the audience were nice about the whole thing, but I had clearly not told the story they expected to hear. They wanted to hear that the Dexter-Hillsdale sightings had been real encounters with spaceships from another world, and that Hynek had lied to the public to help the Air Force with their cover-up. But this story does not fit the facts. So, yeah, this could be fun! NOTE: Astute readers will be aware that Jack Webb, shown above as Sgt. Joe Friday in Dragnet, once produced Project U.F.O., a TV series based on the activities of the U.S. Air Force's Project Blue Book. The series, which lasted only from 1978 to 1979, took a very skeptical view of the UFO phenomenon. Speaking of "UFO experts," did you ever get the opportunity to interview Dr. Jacques Vallee about his experiences and friendship with Dr. Hynek? If not, why not?